← Guest Appearance on Club Chrissie???!!!? Five bags of clothes in the car ready to go to the thrift store. I do see the possibilities in most everything I bring home. Each item does seem to call out to me what it wants to be in it’s next life. But, when the refashion stash gets too big it just becomes overwhelming. In order to keep the creative juices flowing, not to mention being able to find things, I must clean out once in awhile and send some things back out into the world. Who knows what budding refashionista might be needing that perfect item at that moment. Who am I to keep it all to myself? It feels good to be somewhat organized. I’ve still got a long way to go, but the process has at least begun. This might be a no-brainer for some of you, but for me, it was close to an epiphany, complete with lights shining and angels singing. Quite the breakthrough for a girl who had belts, scarves and bags falling on her head every time she reached up in her closet for an accessory. Well, here’s to a clutter free life…….Someday!!! This entry was posted in Uncategorized and tagged crafts, DIY, organize, recycling, Refashion, Sewing, tutorials, upcycling. Bookmark the permalink. Up and at it bright and early aren’t we Beth. Great idea!!! Oh yes, wish I could sew all day. See you in a few…. Hmm- so obvious when you see it-mine keep getting caught in the drawer. I shall re-organise! My closet is a much happier place now, that’s for sure. Brilliant. My closet needs this. My closet feels much better now. I have just gone through a big clean out too. It is hard giving up the things I thought I would redo but it was just getting a bit much. I still have quite a bit to go through. I told myself, for each garment I brought home from the thrift store, I had to take one back. I know what you mean, it’s hard to give it up when I see what it could become. Just not enough hours in the day to sew it all. Great idea! 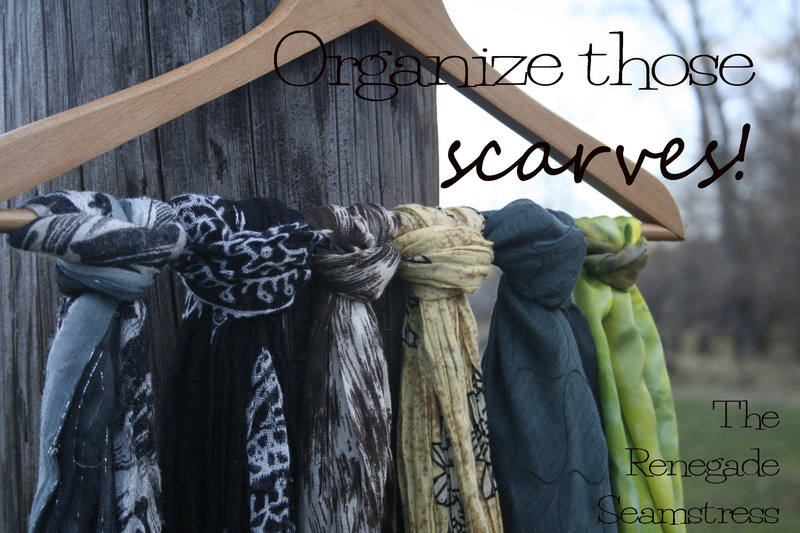 A tangled up mess of scarves is not what we want for the holidays! Such a good idea! I’ll have to do that, too! Wow! I managed to spend the entire afternoon surfing your blog. With my new Juki serger and my old Pfaff sewing machine ready to go, you have inspired me to cull my closet and look for things to repurpose! Thanks for the ideas and easy tutorials. One question…your blue dress form… what brand/model is it? It looks like it adjusts to fit your measurements. Welcome to The Renegade Seamstress! I would love to see your creations! The dress form is from Joann’s. It is adjustable for your measurements, but not necessarily your shape. There are custom dress forms out there, might be my next purchase. So many possibilities, so little time! But you’re right, it can totally get out of control, if we let it. Thanks for the encouragement!